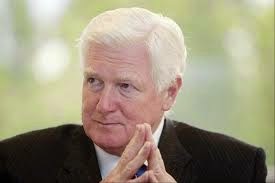 Retiring Representative Jim Moran (D., Va.) said that Democrats got “virtually everything” they wanted in the cromnibus package, as he praised the bill in terms that could double as the conservative critique of the legislation. Moran said that “the Republicans are indicating they need 80 Democrats” and he’s frustrated that Democrats won’t provide the votes. “In 20 years of being on the appropriations [committee], I haven’t seen a better compromise in terms of Democratic priorities. Implementing the Affordable Care Act, there’s a lot more money for early childhood development — the only priority that got cut was the EPA but we gave them more money than the administration asked for,” Moran told reporters Thursday evening after exiting a Democratic caucus meeting in which White House chief of staff Denis McDonough tried to convince members to back the bill. Moran warned Democrats that if the cromnibus failed, Republicans would be able to run over Democrats next year when they control the House and Senate.